Love is in the air and Simon Says Stamp has made it even more fun to create projects to show someone that you love them with their 2013 Valentine's Day release. I was asked to create a project using something from this release to share in today's Valentine's Day Blog Hop. 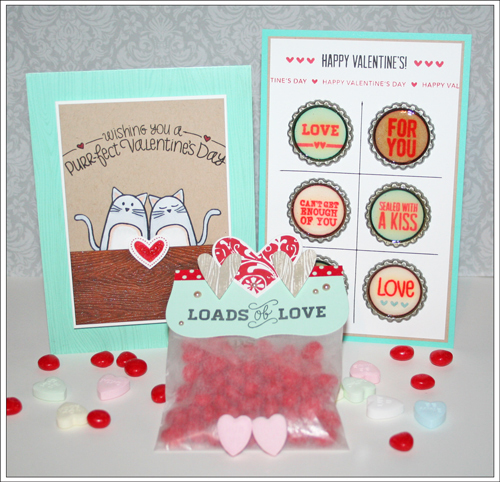 I decided to make a few projects using some of my favourite colours for Valentine's Day - Red, Kraft, Aqua and White and the great new exclusives from Simon Says Stamp. I created the card using a Hero Arts notecard and attached the focal part of the card with foam adhesive to give it some dimension. The kitties are stamped on Neenah Solar White cardstock, coloured with Copics and cut out. I adhered them to the card and then added a piece of the SSS exclusive woodgrain paper that I inked with Gathered Twigs Distress Ink. I stamped the sentiment and stamped and cut out the heart. I added Stardust Stickles to the heart and added it to the card with foam adhesive. The candy is a glassine bag with a topper adhered on top. I cut out Pool Layering paper with a Spellbinders die and then added stamped/diecut hearts with some gems and washi tape to complete it. Leave a comment on this blog post and one lucky winner will receive a Simon goodie bag (if you know Heidi, it will be a good one!!). We will draw the winner on Thursday morning 1/31/13 at 9:00am EST so be sure to leave your comment by then. Thanks so much for visiting my stop on the hop! The next stop on the Simon Says Stamp Valentine's Day blog hop is the amazing and extremely talented Jana Millen! 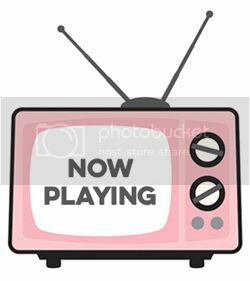 If while hopping, you encounter a broken link, you can go back to the beginning here for links to everyone who is participating in the hop. oh my word how totally adorable.. I love your fun cards..thanks for sharing..
Oh my gosh the magnets - how cute! Fabulous cards and treat bag, Steph! Love the colors! Great cards and treat bag-love the magnets! I love the Purrrfect card! So cute!! So full of inspiration! Thanks so much for sharing this! Great valentine's projects :) Those magnets are so cute! Those magnets are a great idea! Love, love, love the bottle cap magnets, so cool and what an amazing set of cards. I also love the idea of the goodie bag, very cute!! So cute and I love the bottle cap magnet idea-I have to try this one. Wonderful. Love the cards. The goodie bag is cute! Very cute card. Wonderful idea! LOVE the concepts you came up with. So cute and fun. TFS! You ROCKED these Stephanie. Thank you! Oh, how adorable! I am so loving the magnets and your card is just fabulous! wow! great projects! I love the coloring you did on the cats and what you did with that woodgrain paper-what a great idea! those magnets are so cool too! What a cute trat bag, I especially like the pop up hearts! What a sweet card and the magnets are adorable! Magnets! What a great idea. You really did a great job creating this lovely things. Thanks for sharing! Awesome card and love those magnets.. Your card is gorgeous and I absolutely LOVE those magnets too. 2 absolutely beautiful cards, Stephanie! I love the sentiments in the bottle caps too..so cute! I am in love with those heart stamps and matching dies! Love your projects! Thanks for the chance to win! How cool are those bottle caps?! Awesome projects! WHAT!!!!??? THIS IS EXTRAORDINARY!!! GREAT IDEAS! Thanks so much for sharing Stephanie! LOVE LOVE LOVE!!! Stephanie, what great projects! The color scheme you chose is very fun. I really like the bottle caps magnets. Thanks for sharing 3 projects! Great cards! Love those little kitties and the bottle caps are so much fun! The magnets are fantastic. The colors are vibrant and the designs adorable. How did you flatten your bottle caps so perfectly? I love the idea of using them as magnets, thanks for sharing! great ideas! love the magnets! tfs! Too darn cute, I love! the magnets are so clever and look great. Fun and fabulous! Love your projects. Cute idea with the magnets! very creative. thanks for sharing!! Very flattering card stock colour you used. I could stare at theses cards all day, they are so attractive and fun! Awesome projects! I love the colour combo of the red/aqua/white/kraft! Just love both cards. Love that kitty stamp and those magnets are a really cool idea. Amazing cards. I really love the magnets and the little treat bag !!!! Love the cards and great to make a present this way! Bottle caps galore. Great ideas. Love your magnets!! Great ideas!! I'm glad no one can hear me squeal with delight!!! Love the bottle caps on that card and your embossing and inking on the wood look for the kitty card! Please, please, please tell how you flattened the bottle caps...I LOVE them! Wow, such amazing off the page inspiration! How did you flatten the bottle caps so neatly? How fun! Really love the treat bag! love the cats! so adorable! Thank you for ALL of this awesome inspiration and for sharing it with all of us. Looks super cute! Thanks for sharing! Thanks for the chance to win! Love this two cute cats! Super cute card and just LOVE those magnets! The flattened bottle cap idea is just genius! TFS! love the turquoise with the pinks :)!!!! I just love your fun cards... I just love the Furry Animals stamp set. The second is absolutely genius! I love it! So cute! Love the bottle caps! Such sweet cards! Love your cards! The kitties on the card are adorable as is the treat bag and the bottle cap magnets are unique! What fun projects! The woodgrain is fabulous as are the magnets! Great projects, funny how the bottle cap art has come back into fashion! I'll have to get my stash back out! So thrilled that you are doing a video on the bottle caps next month! How unique an idea using the bottle caps is that! Love the bottlecap magnets - thanks for sharing your talents. So fun! I LOVE the treat bag! Beautiful projects, love the treat bag! Thank you for sharing! Love the magnets! What nice keeper for the recipent. Love those kitty stamps. Thanks for sharing and inspiring us. Marvelous cards! Those cats are so cute! Thanks for sharing your cards. Cute cards, thank you for sharing! How fun! Love the magnets! Cute, cute, cute! Love the fun ideas, especially the magnets! These are sooooo cute! Thanks for sharing! So creative! Really liked all you did. Great vintage look on the magnets. Thanks for the tip. Your cards are really cute! Stephanie, the Loads of Love treat bag is just adorable, how fun to give those to friends. Thanks for sharing your creativity and thanks to SSS for a chance to win their goody bag. Such cool cats! Love the little treat bag! thanks for the inspiration - the bottle caps are great! Adore the cats. And the magnets--what a cute idea! Cute cards! Love he goodie bag! Love the cards and the sweet bag topper! Love the magnets - such a clever idea! Oh my goodness, I love all of your adorable projects! So fun! I adore that candy bag. I will try making it for my teachers. How lovely! Wow - your cards are stunning! I love the aqua backgrond - it's different and really makes everything pop! Love the candy bag and those magnets are awesome!!! These projects are so cute! Thanks! I love all of your projects! 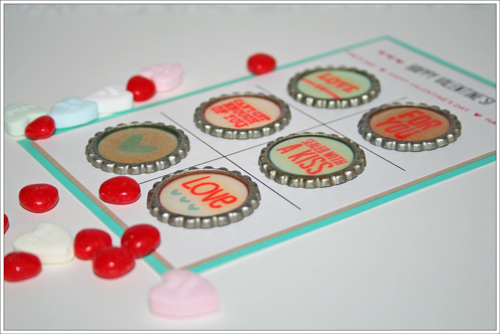 Such a pretty card and candy bag topper...and the magnets are a fabulous idea...I LOVE the vintage look of them! Thank you so much for sharing your creativity with us, and for a chance to win! Looks like cats rule this Valentine's Day. Lovely design. What a great idea for a Valentine treat for those special people in your life! Easy,fun and appreciated. I will be watching for your tutorial on the magnets,another fun project. Great projects, Stephanie! I like your choice of colors. Love your projects! The bottle caps are great! Fantastic projects. Love those magnets, very clever. What a fun little ensemble! A little something to read, a little something to eat, and a little something to use everyday. Love it! Your cards are so fresh and clean. Love them. Thanks for sharing. Your project are fun! Well done! This is great!!!!!! Love the designs!!!! So awesome!!! Love your creations!!! Digging the magnets...super super cute! Fabulous card with the kitties!! Adorable....love the bottle caps & magnets! Great job! Great ideas. Love the bag topper! Girl....so fun! I'm speechless. The magnets, WOW. And just so you know the name of your Blog, priceless! Thanks for sharing. LOVE the card and the magnets! Thanks for sharing and thanks for the inspiration!! Absolutely love each piece! Great ideas!! 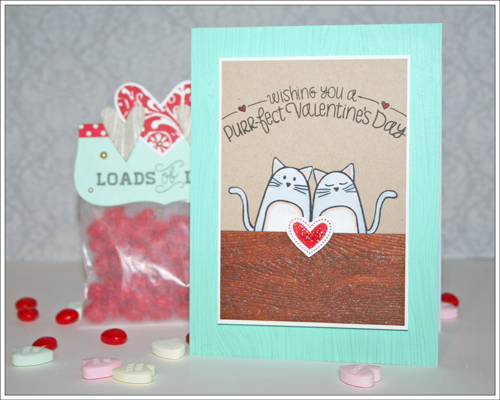 The magnet idea is so great and your kitty card is very sweet! Looking forward to the bottlecap magnet video...Your gift bag and card is great, however the bottlecap magnets VERY unique! Wow-the bottlecap magnets are so adorable! The bottle caps are sooo great! super cool Ideas Love the Card and love love the Magnets they are Awesome. love the treat Bag. thanks for sharing and for the chance to win. Your projects are beautiful and so creative. Love your projects! Will definitely come back for the bottle cap video! Thanks for doing that for us! How creative and fun! Thanks for the inspiration and I'll be back for the bottle cap video! Love your work. Love the cards and bag topper! All are so cute! Thanks for sharing! What a cute set ...love the magnets and I look forward to seeing how you made them in your tutorial. Just so fab, love your style! wow this is such a cool set! I love the look of the bottlecaps! Adorable and I love the magnets! Great projects! Those cats are so cute! Have to get that stamp! The cats are cute... but wow, wow, wow those bottle caps are fabulous! I'll keep an eye out for the tutorial - thanks so much! The kitties are so darn cute, perfect for Valentine card. Thanks for sharing. Really cute magnets. I also liked the way you used the washi tape. Thanks for sharing. Very cute. I am so lusting for those heart dies! So many great uses on this blog hop!I love the bottle cap magnets! Three cute and different Ideas.I will have to try the magnets. ok so i am so excited about the magnets! im off to make some for my daughters board in her room!!! Love the Bottle Cap Card. The topper is really cute too. Thanks for sharing. Love the bottle cap card too. Great idea on the candy topper as well.